Traditionally the 10″ Android tablet market has been a pretty disappointing affair. The big name tablets like the Galaxy Tab and the Asus Transformer series have both sold in numbers which have obviously been enough to warrant sequels and further investment by their respective companies. But so far however, they have failed to set the world aflame with desire. The announcement by Google that they would be releasing a 10″ Nexus tablet was met with some scepticism by the Android community at large. Putting my own scepticism aside, I decided that I would give one a go and went ahead and purchased a 16GB Nexus 10, which this review will be based on. The Nexus 4 was leaked almost completely prior to the launch date. A near complete review of the unit appeared online prior to the official launch. Not so with the Samsung built Nexus 10. It was shrouded in the same veil of secrecy that Samsung mostly managed to achieve when building the Galaxy S III. The 10″ tablet was almost a complete surprise before the Nexus launch with only some vague references to a ‘Manta’ platform showing up in benchmarks and web server logs in the lead up. We also saw some HDR photos taken on the Nexus 10 appearing in Vic Gundotra’s Google+ profile mere days before the supposed launch in New York. The launch for the Nexus lineup this year was hampered by the incoming hurricane Sandy. The launch could almost be described as an anti-climax as the event that was planned to announce the devices was downgraded to a Google Blog Post. The devices descriptions were then dumped into the Google Play Devices section with a note stating they would be on-sale from November 14th. When the Nexus 10 finally went on-sale around midday on the 14th of November, the 32GB version sold out within just a few hours. Sale of the 16GB version had a much slower burn and took almost a month to deplete the initial stocks to the point of selling out. So far since the devices sold out there has been no indication of a return of stock and no word from Google as to when this will occur. There have been some rumblings from Australian retailers. Harvey Norman advised that they would be stocking the Nexus 10, but no store that Ausdroid has spoken to as yet has actually confirmed an order is in the system and is on its way. Mobicity has certainly taken the ball and run with it taking orders for both the 16 and 32GB versions. There is however a premium on both devices over the standard pricing in Google Play, but as this is a supply and demand economy — if you do want the tablet then you will have to pay whoever has stock. The Nexus 10 comes in a multi-coloured box in the same design as the Nexus 7. The tablet is laid atop a couple of accessories including a 5 Volt 2 Amp charger with USB port, USB Cable to connect the charger to your device and a Nexus 10 quick start manual. Google has shown off two official accessories. 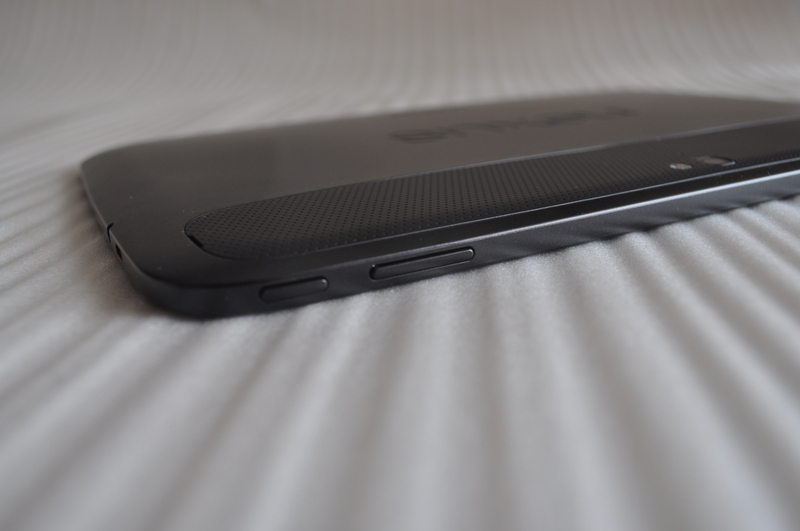 The first, at launch, is a Smart Cover which doubles as a stand. The second is a Nexus 10 POGO pin dock which was shown off in the recent Happy Holiday video. However, Google has been silent on when or if they will ever actually release these accessories for purchase. The Nexus 10 comes preloaded with the latest version of Jelly Bean, Android 4.2. Amongst the goodies included are Lockscreen Widgets, Gesture Keyboard, Quick Settings Menu and most importantly for a tablet, Multi-User accounts. There is the usual assortment of Google Apps. Currents is now installed by default and Chrome is now the default browser. There are also immediate updates available for the tablet once you power it up and you’ll be notified to download and install them straight away. In terms of tablets Google has a LOT of ground to make up in the 10″ market. They have to catch up with the already well established hardware and software of the iPad, especially the App Eco-system. So, how did Google fare with the Nexus 10? Read on and we’ll lay it out for you. 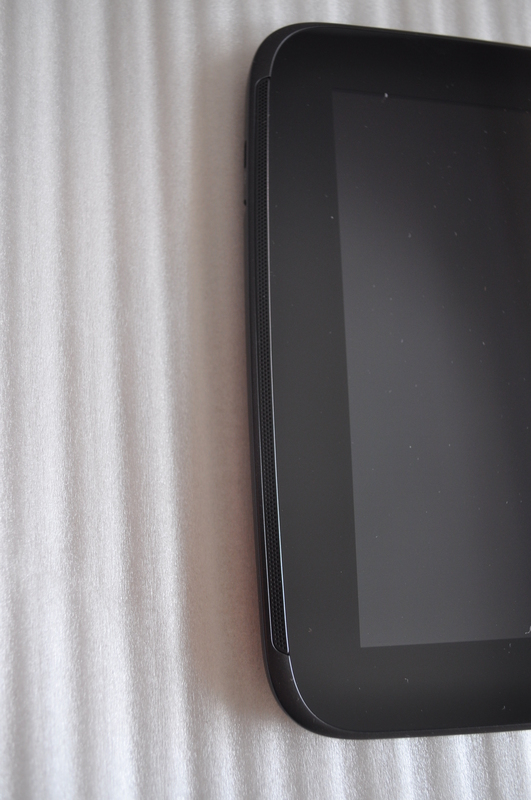 The first thing you notice about the Nexus 10 when you take it out of the box is that it feels really nice in your hand. A combination of the soft touch plastic casing and the lack of flex anywhere in the device makes the Nexus 10 something that has to be held to truly be experienced. I can only describe the overall experience of holding the Nexus 10 as comfortable. The Nexus 10 being manufactured by Samsung was a concern for me. My previous experience with the build quality of some of their devices wasn’t the best. However with the Nexus 10 Samsung was given excellent direction and managed to make quite a premium product. The tablet feels solid like it’s made of much stronger stuff than Samsung usually uses. A look back at some recent products from Google starting with the CR-48 Chromebook shows a move towards the soft touch rubberised material that the Nexus 10 is coated in. 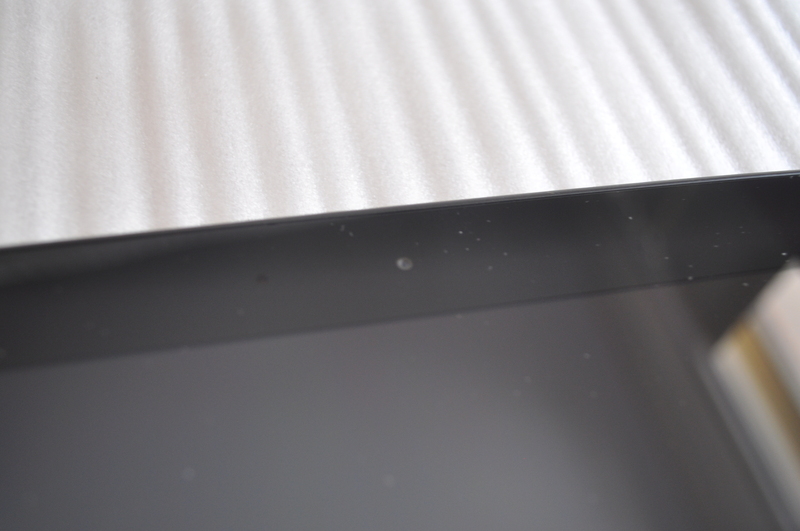 Owners of the Nexus 7 will know the material as it also adorns the back of their tablets. They will know that it is quite comfortable to hold and easy to grip as opposed to the slick plastic or metal backing on other tablets. With all the advantages in comfort and grip that the rubberised material on the back of the Nexus 10 brings (I wouldn’t change it for the world) it does have one downfall. It is an absolute fingerprint magnet. This is obviously just something that you’ll have to deal with. I found that simply wiping the front and back of the device down with a lint free cloth did solve the issue somewhat but it is something to think about. Along the back of the tablet around the camera is a removable grill type plastic mesh. This is where the Smart Cover (mentioned in the Into above) can be added. As that accessory hasn’t been released yet I am loathe to remove the grill just to test this out. The biggest thing that attracted me to the Nexus 10 was the screen. The 10″ 2560×1600 resolution Super PLS Display that packs in 300PPI makes viewing anything on the Nexus 10 an experience that actually has to be seen to be believed. From basic text in an eBook or a webpage to viewing a Hi-Def movie your eyes will be amazed. Also, with Gorilla Glass 2 protecting the front panel the chances of accidentally doing something to physically damage the display is ameliorated. The screen used on the Nexus 10 is truly excellent. It’s not only sharp but the contrast is good too. Blacks are black and colours really pop on the display. As far as viewing angles go I can lay the tablet flat on my desk and still watch movies or surf a web page without worrying about the angle. That said, a nice official dock accessory would be welcomed to prop it up on a desk. In terms of movies you will want to make sure you have a minimum 720P resolution video when watching videos on the Nexus 10. Anything less than that just shows how poor the quality of the video you’re viewing is. The GPU handles 1080P video with no issues and quite frankly I was happy with the screen and performance of video on the Nexus 10. All of that said there is a downside to the viewing experience on the Nexus 10. It’s the lower resolution of the supplied icons on Android Apps. Google have begun to remedy this with their own apps. When looking at the display if you look at some of the Google App Icons like GMail and Chrome they look like they have been designed with the higher resolution display in mind. When you move onto 3rd party apps you certainly run into a problem that needs to be addressed at some level but most importantly by 3rd party developers who just want their apps to look good. Google when building Nexus devices relies on it’s manufacturers to supply the parts they require for their phones or tablets. 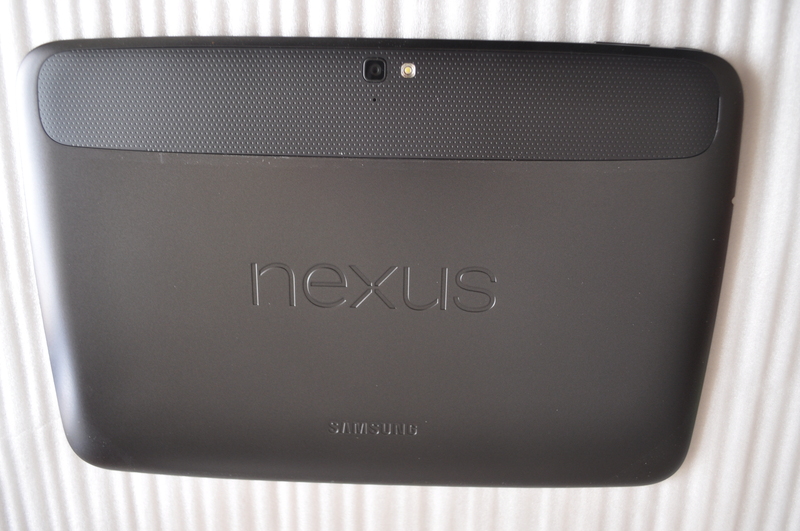 In the case of the Nexus 10 it was Samsung supplying the Exynos 5 Dual-Core 1.7 GHz, ARM Cortex-A15 CPU. This has been combined with a Mali T-604 GPU and 2GB of LPDDR3 RAM. This combination of CPU, GPU and RAM means the Nexus 10 is prepared to handle pretty much anything that you can throw at it. Gaming on the Nexus 10 is pretty good. Most of the games I played from GTA: Vice City, Subway Surfers and Real Racing 2 all the way up to higher end games like Dead Space and Need for Speed Most Wanted played fairly nicely with only minimal lag at the load up screens. Once into the actual game there is little to be displeased about with the games running smoothly. Sadly the Nexus 10 suffers from a bug that has affected most of the tablets I’ve reviewed so far, slow I/O speeds on their NAND memory. When doing something like downloading a file in the browser and watching a video at the same time the tablet slows down to a crawl and video becomes a jerky almost un-watchable experience, this has been a common thread in most reviews that have tested out this capability and ideally I would like to see this addressed on the next iteration of the Nexus 10. The other place that the Nexus 10 experiences ‘lag’ is when switching between accounts using multi-user. When you select the new account to log into there is a noticeable bump in response between registering that you want to use another account and bringing that account to the forefront, once the account is selected the normal buttery smooth operation continues but the bump is enough of a problem to specifically mention. The other performance issue of note that must be raised are the reboots, the Nexus 10 indeed many of the Nexus devices running Android 4.2 suffer from random reboots. This has been reported to Google on the Android code page and seems to be a widely experienced bug. One can only hope that the rumoured Android 4.2.2 update will provide a much needed fix for this annoying fault. The Nexus 10 comes with a 5MP rear facing camera unlike its cheaper and more slimline smaller brother the Nexus 7 which shipped with only a front facing camera in order to deliver a product at a particular price point. 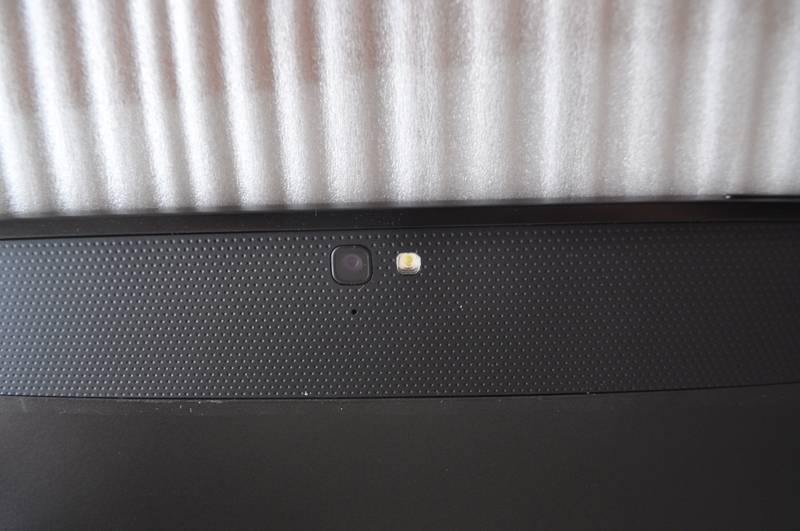 The Nexus 10’s 1.9MP front mounted camera is obviously aimed at video conferencing. The rear facing camera is not going to win awards but it’s serviceable. If you absolutely must pull out a device with a 10″ screen to take a photo, then you will be able to capture the shot with no issues and in fairly decent quality. But please think before you do this. If you have any other way to capture a shot, use it. The rear facing camera is paired with an LED Flash for taking shots at night or in low light conditions. Like the 5MP camera on the Galaxy Nexus, low level light conditions are still not the friend of Nexus devices unfortunately. Perhaps the recent acquisition of digital imaging patents from Kodak will make for improved imaging in future Nexus devices. The Nexus 10 does do PhotoSpheres. I took one and you can see it on my Google+ Account here. It was actually marginally easier taking the PhotoSphere on the Nexus 10 than I have found it to be on the Nexus 4 but that said I stand by my statement of no-one should be using a 10″ tablet to take photos. The 5MP camera captures perfectly good 1080P video at 30 frames per second and the resultant MP4 files can be viewed on just about anything. Disappointingly the audio appears to be in mono but again, why are you using your tablet’s camera to capture anything? The 1.9MP front facing camera on the other hand performs excellently for its intended purpose. It gives you the ability to use Skype and Google+ Hangouts to your hearts content with the added bonus of capturing 720P video. You can obviously also capture 1.9MP still shots as well. Android devices have been a mixed bag in terms of both audio quality and quantity (volume). This has not been Google’s fault but it’s the OEMs who integrate the OS onto their lower end devices with no thought to the audio experience. The Nexus 10 however, delivers well on both of these fronts. The Nexus 10 has two ways to experience audio. You can use the standard 3.5mm headphone jack or the dual front facing speakers which are mounted alongside the screen. This is a first in that most of the current tablets on the market mount the speakers at the rear of the device. Why this hasn’t been done by others is something I cannot comprehend after experiencing the front mounted speakers on the Nexus 10. Having the speakers mounted at the front gives a greater clarity of sound without relying on having to reflect the sound. Just how good a choice it is to mount speakers at the front of a tablet cannot be overstated enough; it is simply brilliant. The volume on the headphone jack is pretty decent, however the clarity has a small issue. When there is no sound playing a small amount of static leaks through. In the scheme of things this is a minor issue and is only really present on lower end unshielded head or earphones. Overall, most people will be happy with the sound quality and volume levels on the Nexus 10 through both the front mounted speakers or through headphones. Lack of 3G on the Nexus 10 has been lamented by some potential customers. Given that a 3G Nexus 7 arrived some months after the initial launch a Nexus 10 3G model could conceivably be launched down the track. Until then you’ll have to rely on the Wi-Fi connection which is 802.11 b/g/n but includes MIMO and HT40 on both 2.4 GHz & 5 GHz bands. It locks onto Wi-Fi networks on both bands extremely well no matter where I’ve attempted it. MIMO support gives the Nexus 10 the ability to transmit and receive data simultaneously giving better throughput of data with HT40 giving 40MHz of bandwidth to either transmit or receive. Both the MIMO and HT40 support are noticeable so I receive excellent Wi-Fi speeds on my home network. The Nexus 10 contains full GPS Support with GLONASS. This means that you have the full support of not only the US Military but the Russian Space Agency as well helping you navigate your way around the streets in your town. Using the Nexus 10 as a navigation aid would make a lot more sense if some manner of car mount existed. If you intend to use the Nexus 10 to navigate when walking around then it works fine. Bluetooth works fine on the Nexus 10. Keyboards, mice and headsets all connect with no issues. The inclusion of Bluetooth 3.0 instead of the more power friendly and higher range Bluetooth 4.0 (which is compatible with more modern Bluetooth accessories) is a bit of a mystery but the device has got Bluetooth and that’s all that is required for most users. Headset support on Bluetooth seems fine although there have been a number of documented occurences of Bluetooth streaming in Android 4.2 being broken, I didn’t however find this on the Nexus 10, streaming works fine giving a fair distance as well. NFC is included on the Nexus 10. In fact it has two NFC Chips according to the blurb on the Google Play Device Store. The NFC points are located on the front and back. On the front it is located to the left hand side of the front facing camera and on the back it’s located on the right hand side of the rear camera. What you’ll notice in practice is that the points are virtually just front and back of the same area indicating that the device most likely has one NFC chip but two antennas to receive NFC signals. Using NFC is similar to any NFC capable device. Using Android Beam you can share webpages, photos/videos or maps with NFC. Just hold the devices together and the ‘Touch to Beam’ option comes up. Unfortunately with no Google Wallet in Australia you can’t use your tablet to pay for things using NFC just yet but that would possibly be as awkward as pulling out your 10″ tablet to take a photo. 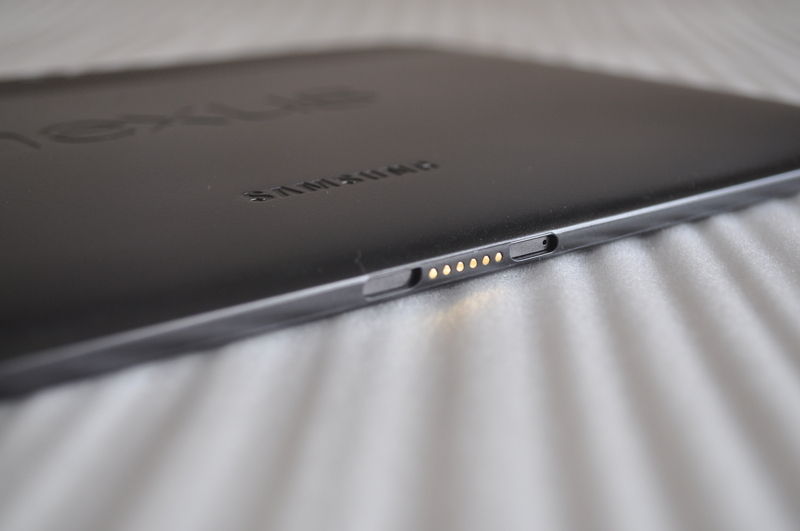 With a 9000 mAh Lithium Polymer battery installed the Nexus 10 is a monster in terms of battery life. It just would not die, I would leave the Nexus 10 on over the course of a week and not use it all the while leaving it connected to Wi-Fi, syncing Gmail and Twitter and come back to a tablet with a battery that had barely gone down in percentage used. The flip side to the insanely good battery life on the Nexus 10 is that the tablet does take an inordinately long time to charge. From a dead flat 0% battery it takes around 8 hours to fully charge. With the long battery life that the Nexus 10 gives in use however this is generally something I’m willing to forgive and mostly just leave the tablet on to charge overnight. What Accessories is my question that I’ve presented to Google. So far the Nexus 10 has absolutely nothing officially announced. What we have seen is a Smart Cover that was shown off in a video from The Verge when the Nexus devices were released. The other ‘official’ accessory, the Nexus 10 dock, was shown off during the Happy Holidays video released at Christmas which takes advantage of the dock connector on the base of the Nexus 10 when sitting in landscape mode. Unfortunately a date for when these ‘official’ accessories are due to hit the market has never been released. Third party accessory manufacturers like Targus and Belkin have been slow to the game in releasing accessories for the Nexus 10. There are options out there from rotating cases to smart covers, slip cases and keyboard cases. Docks are pretty rare but a Magnector cable which utilises the POGO pin connector has shown up on eBay. At the moment I use a neoprene slip case I picked up from Officeworks on the cheap. This seems to be a pretty easy thing to get with the overabundance of iPad accessories out there. Most of them go to waste and end up in the bargain bins which works well for me and indeed anyone looking for a cover. In terms of a stand I use a couple of modified blank plates from a desktop PC which I’ve wrapped in electrical tape to prop the tablet up on my desk. The software supported on the Nexus 10 is Android 4.2 which includes all the latest goodies from the latest Android Jelly Bean release. The tablet however doesn’t ship with these updates and requires a couple of updates as soon as you turn it on out of the box. The good news is that this includes updates to 4.2.1 which reinstates December in the people app and gives Bluetooth controller support back, unfortunately it doesn’t include the Bluetooth A2DP fixes but that is expected in Android 4.2.2. One of the biggest concerns raised by Android fans when the Nexus 10 was released was the fact that the home screen uses the phone layout rather than the ‘Tablet’ layout that we saw on early versions of ICS and even as far back as Honeycomb. I personally am a fan of the Phone layout, but only to a degree. The one part I have issue with is not as apparent on the Nexus 7, but on the Nexus 10 it becomes a pretty big issue. The Back, Home and Multi-Tasking buttons are not easily accessible in landscape mode. The tablet is supposed to be used in landscape mode as its aspect ratio makes it awkward to use in portrait, unlike the Nexus 7. Moving these buttons to the left or right of the screen (Google: Please do this with an option to orient left/right hand side in settings) would make the tablet infinitely more easy to use. The swipe down notification panel is quite easily accessed using a swipe down with the left thumb when holding the tablet. Similarly, the quick settings menu is easily accessed by swiping down with the right thumb. However, my personal opinion of the quick settings menu is not a good one. It seems almost pointless because it only provides pointers to the settings menu. My question to Google is why did you not just allow settings to be changed from within this panel? Also, why was the option to add more settings to this pane not added? Amongst the best updates added with tablets in mind is multi-user account support. To be frank it’s awesome! It’s delightfully simple to setup and quite well sandboxed. Users with secure access on their tablet still require that pin/pattern/face unlock to be utilised before it can be used. The login method is quite simple with user icons appearing on the lock screen. You simply select whichever one you want to use. Overall, this is a feature that all tablets should have regardless of which OS it runs. A few people have suggested that any apps installed on the tablet should be available to all users regardless of whether they have purchased the app or not. I personally don’t believe this should be so unless the license the app is sold under is per device not per user. In which case it also presents issues for using on a phone or tablet, but this is an argument best left for later. It’s merely a question of licensing and if devs are happy for this to happen then what is the harm? Lockscreen widgets are more useful here on the larger screen than they are on phones like the Nexus 4 in my opinion. With more and more apps adding lock screen widget support this function is fairly useful but it does get to the point where you realise you’ve added too many widgets. The you begin to wonder why you don’t just unlock your device to access what you’re after? The keyboard is serviceable but I still tend to find myself installing the Tablet version of SwiftKey as it seems to fit a tablet layout a lot better. That said, you can’t deny that the Android 4.2 keyboard is pretty darned good. Gesture typing which was also added in 4.2 is simply amazing to use. This is more a personal choice of course, but the implementation of gesture typing does work well. Daydream is supported on the Nexus 10, indeed on all Nexus devices running Android 4.2. It remains to be seen if this particular feature will make it into the Android versions released by manufacturers like Samsung or HTC. Personally I’ve yet to find a real use for this Android feature. Perhaps when some sort of docking attachment becomes available it will be useful? The basic concept for Daydream is that it will act as a kind of screensaver, displaying any one of a variety of content from your tablet. You could use the Jelly Bean easter egg screen, news stories from Google Currents or perhaps photos from your photo streams, but at this stage the addition is fairly limited for my use case anyway. The Nexus 10 has a notification light and why this hasn’t been done before is unbelievable! It’s such a simple thing but is really handy to have. I often have my tablet on the desk just sitting connected to WiFi with the screen turned off and the notification light now alerts me when something comes in. With apps like Light Flow you can manage these notifications with a lot of control, including things like vibrations, which brings me to my next point. 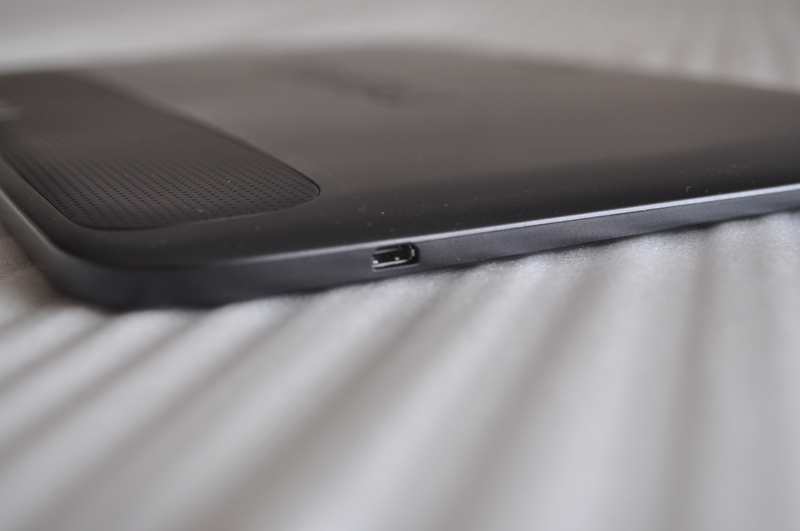 The Nexus 10 has a vibration motor! One of the things I missed on the Nexus 7 was the haptic feedback on the keyboard due to the lack of a vibration motor in there, in the Nexus 10 Google has put the vibration motor in there again making the Nexus 10 a pleasure to type on. It’s a fairly strong vibration too so you won’t be missing any alerts. Mistakenly hitting a key and not realising it when typing is less likely too. 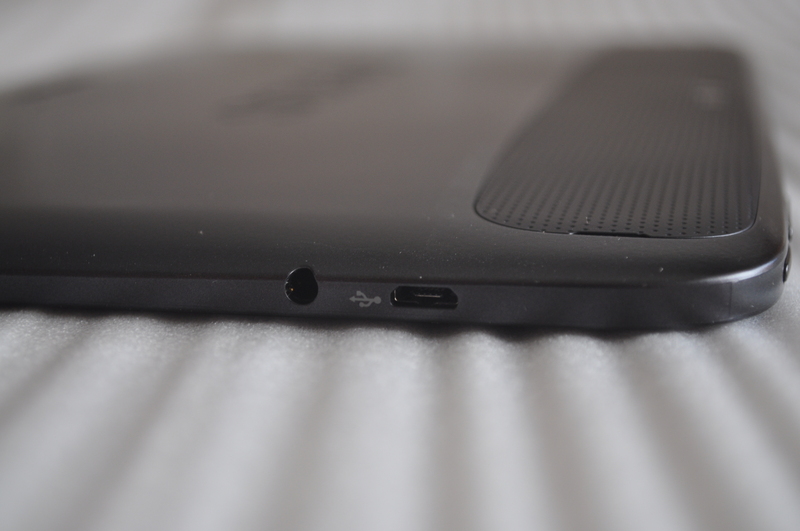 The Nexus 10 features a Micro HDMI port on the right hand side to allow you to connect your tablet to a TV. Simply plugging a Micro HDMI cable into the port immediately enables mirroring on the larger screen and there is nothing to interrupt the experience – I saw no lag at all. The HDMI-A to HDMI-D cable I picked up cost $25 from JayCar but there are other options available from places like dx.com if you’re willing to wait. While connecting to a TV’s HDMI port is easily achieved, the lack of Miracast support on the Nexus 10 is still a puzzling one. The addition of the Micro HDMI port does somewhat ameliorate the effects of not having the functionality that you would otherwise get with a wire free solution. If Google were to have the Nexus 10 certified for Miracast wireless display down the track I certainly wouldn’t argue. Sadly, there is still one area where Google and Android are seriously lacking: The Android tablet eco-system. It is infinitely better than it was even 12 months ago but that’s not to say it’s good. All of the Google Apps like GMail, YouTube, Chrome (or Chrome Beta), Maps etc. all look great on this and any other 10″ tablet, even some of the better apps like Evernote, Pocket and IMDB look good but the tablet friendly apps are too few and far between to count as a serious tablet app eco-system. Even the mere act of discovering apps with a Tablet specific interface in the Google Play store can be a challenge. The Google Play team has a curated list of apps they recommend for Tablets which you can find here and even specific Tablet App market apps exist on the Google Play store. For example, the Tablified Market HD app, but this still doesn’t help hugely. I feel as though I am getting to the point of being a broken record with this every time I review a tablet but Google really needs to do something to motivate developers to up their game with regards to producing apps using fragments to allow for apps with a tablet interface. Google is definitely aware of the issue, they recently introduced a Tablet App Quality Checklist to help developers refine and improve their tablet interfaces and personally I am at a loss as to what else they can do to encourage this. The upside with using Android on a Tablet is that as a user, my main interaction is with the browser and Google does have the best (IMHO) or at least it does now with the Chrome Beta browser, it’s fast, fluid and responsive easily giving the best experience for web surfing I’ve seen. When it comes down to apps the majority of apps most users have are Google Apps and so far I’m happy with what Google has done, I just want to see some more developers getting tablet apps out there. The Nexus 10 is good. The main issue at the moment is availability. Right now, the Google Play Store is showing “TEMPORARILY OUT OF STOCK” for both the 16 and 32GB versions. To make matters worse, Australian retailers are not even stocking the Nexus 10. Customers have been left with no other option but to look at third party importers like Mobicity and Techrific – these are currently the only places you will be able to acquire this magnificent tablet. You do not mention the compass not working correctly with any program using that very compass. Up to 180º out and shows any value except the correct one. Calibration either in figure-8 or rotating 2 times over each axis does not help. This was a really good review. Plenty of content and well thought out opinions and no hype. It’s the first thing I’ve read from Ausdroid and I’m going to be back! Also, I know its idle battery life was great – but how does it last browsing, watching videos, etc.? How does it hold up with active usage? I really like my Nexus 10. I fixed 99.9% of the random reboots by turning off all location services. I’ve been enjoying my nexus 10 a lot. The random reboots are annoying, like 1-2 times a day. But compared to the n7, this really did do tablet apps so much better. Falcon pro / Reddit Sync are great example… WIth columns on one side and content on the other. I think the keyboard was kinda useless though. Can’t believe google still don’t have a split keyboard. The on-screen buttons in the centre are a joke too. I have been a HUGE fan of Android for many, many years – with the phones. But is it just me, or does the Android tablet market been forgotten by Google. I want to like them, but it seems like there are a multitude of little things which all add up to be a pain. I wanted to like the Nexus 10, but honestly don’t think I’ll buy one. I actually rooted the Nexus 10 and use Stick Mount with a USB OTG Cable and a USB Flash Drive. Works like a charm except when the power is low and you need to charge. This is where the Desktop POGO Charging dock would be bloody helpful……comeon Google release the thing already! Everyone has different requirements. For me storage has never been one. I stream almost everything now days. I’m glad somebody else finds the single, centred layout of the action buttons a pain. As soon as I saw the first screenshot for Jellybean on 10 inch tablets, I knew it’d be trouble. Yup.. this plus the non split stock keyboard were misses from google. Not earth shattering, but they definitely make it less comfortable to use. CAT S61 — Australian Review · 34 mins ago.